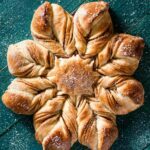 Cinnamon Star Bread is a delicious sweet bread filled with cinnamon and twisted to look like a Christmas Star or Snowflake. Sift flour into medium bowl, then hand whisk in salt and nutmeg. Set aside. In bowl of stand mixer, combine yeast, warm almond milk, and sugar. Gently stir together, then leave to rest for 10 minutes or until frothy. Once yeast mixture is foamy, add butter and vanilla, mix with paddle attachment until combined. Then spoon in 1/3 of the flour mixture and mix on medium speed with dough hook. Beat dough at medium-high for 5 minutes, then transfer to large lightly floured bowl. Once dough has doubled in size, place onto lightly floured surface. Use a large knife or bench scraper to cut dough into four four equal pieces. Shape each piece into a ball, cover the balls with a thin towel, and allow them to rest for 15 minutes. While dough is resting mix together sugar and cinnamon in a small bowl. Preheat Oven to 400 F and line a large baking tray with parchment paper. Gently transfer the first circle onto a parchment paper lined baking tray. Brush a thin layer of beaten egg on the surface of the first circle of dough leaving a 1/4" bare rim. Then sprinkle a thin coating of the cinnamon/sugar across the egg wash. Roll out second circle and repeat process to more times. Place the fourth dough circle on top. Brush a small amount of egg wash across the top layer without adding the cinnamon/sugar. Take a sharp knife and cut the dough into 16 equal strips. Use the round imprint as a guide for a stopping point to keep from cutting into the center. Using two hands, pick up two adjacent dough strips and twist them away from each other 'twice' so that the top side is facing up again. Repeat with the remaining strips of dough so that you end up with eight pairs of strips. Pinch the paired ends together and shape into an overlapping star point. Brush star with a coating of the egg wash, try not to go over the cinnamon, but just lightly coat the dough. Transfer to baking sheet and cool for 15 min. Serve warm!